(20246-38-145-6, John Melton Collection, OHS). Charles Burnham "Bud" Wilkinson, born April 23, 1916, in Minneapolis, Minnesota, was only thirty-one when he became the University of Oklahoma (OU) head football coach in 1947. He created a college football empire during his seventeen years with the Sooners. His Sooner teams earned a 145–29–4 record, including five undefeated seasons, three national championships, and a national record of forty-seven consecutive games without a defeat from 1953 through 1957. 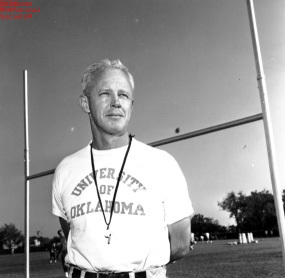 His 1948–50 teams won thirty-one straight, and his Sooners won national championships in 1950, 1955, and 1956. Oklahoma also won fourteen conference championships under Wilkinson, plus seven of nine bowl games. Wilkinson played football and hockey at the University of Minnesota, earned his master's degree at Syracuse University, and served in the U.S. Navy during World War II. He coached football with Jim Tatum at the Navy's Jacksonville, Florida, program and followed Tatum to the University of Oklahoma in 1946. When Tatum moved to Maryland in 1947, Wilkinson became head coach at OU. He also became athletic director at Oklahoma. In 1964 he resigned as head coach and ran unsuccessfully against Fred Harris in the race for a U.S. Senate seat. He had earlier served as head of Pres. John F. Kennedy's national physical fitness campaign, and during the Nixon administration he was a White House advisor. Wilkinson coached the St. Louis Cardinals in the National Football League during the 1978–79 seasons and later served as a sports analyst and broadcaster for ABC and ESPN. He spent several years on the boards of the Lifetime Sports Foundation and the Planned Marketing Association, and he was founding president of the Public Employees Benefit Services Corporation, which he served as chairman of the board until 1982. Wilkinson and his wife, Donna, had two sons. Coach Bud Wilkinson, elected to the College Football Hall of Fame in 1969, died in St. Louis, Missouri, on February 9, 1994, of congestive heart failure. Daily Oklahoman (Oklahoma City), 10 February 1994. "Bud Wilkinson," Vertical File, Archives, Oklahoma Sports Hall of Fame, Oklahoma City, Oklahoma. Jay Wilkinson and Gretchen Hirsch, Bud Wilkinson: An Intimate Portrait of an American Legend (Champaign, Ill.: Sagamore Publishers, 1994). Max Nichols, "Wilkinson, Charles Burnham," The Encyclopedia of Oklahoma History and Culture, https://www.okhistory.org/publications/enc/entry.php?entry=WI013.